It's not been a 'great start to the day' for the Swiss-based company. The Advertising Standards Authority (ASA) gives with one hand only to take away with the other. While Mulberry’s Christmas campaign lives to fight another day, Nestlé is in hot water because of a Nesquik ad. The former used a luxury handbag in place of baby Jesus in a tongue-in-cheek take on the nativity story, which drew 42 complaints saying the ad was blasphemous and offensive to Christians. The ASA concluded it was a ‘playful and ridiculous comparison’, which was more likely to be seen as a humorous reference to consumerism rather than ridiculing the religious story. 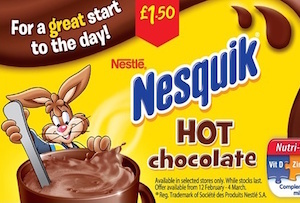 Nestlé UK meanwhile, ran an ad on Asda’s own-brand milk labels featuring a bunny character stirring a cup of Nesquik hot chocolate. But according to the Children’s Food Campaign, the advert’s claim ‘For a great start to the day!’ encouraged poor nutritional habits in children, since the drink was high in added sugar. That and the choice of the bunny character was apparently a step too far. Nestlé unsurprisingly denied the accusation, saying the bunny wasn’t the main focus of the ad, and that it had been ‘carefully designed to convey a physically active, energetic character who could promote a healthy lifestyle’. It also said the strapline didn’t encourage excessive consumption but just showcased Nesquik as an option that could be considered alongside other breakfast foods. Nestlé did though admit that three teaspoons of Nesquik combined with 200ml of milk contained 20.2g of sugar – though 9.6g of that would come from using semi-skimmed milk. The food firm hasn’t been the easiest company to feel sympathy for over the years, coming under fire for use of child labour among its suppliers and aggressively pushing the health benefits of infant formula over breast milk in developing countries. But this latest ASA ruling is maybe a little harsh. While the regulator agreed the strapline was ambiguous, it said in the context of the ad, the implication was that it had a general benefit to health, particularly because of the inclusion of a small text box called ‘Nutri-Start’ outlining the nutritional content of the product. Really, it seems a bit of a leap to think that’s going to be the first conclusion to come to mind. A small box providing some nutritional information is hardly a grandiose claim on the health benefits of hot chocolate. Nonetheless, the ad won’t be allowed to reappear in its current form, as health claims are only allowed to be made under the advertising code if they are accompanied by verified evidence – which the Nesquik ad was not. Nestlé might have been 'disappointed' with the ruling, but it's still going to have to rethink its marketing approach. Do Black Friday discounts really work?